This San Diego California condo has hardwood floors throughout. Each bedroom in this vacation rental home has a queen size bed with ample closet space. Amenities at this San Diego vacation rental include full use kitchen, wood burning fireplace, forced air heating, indoor and outdoor dining area in front of three large picture windows enabling a full white water ocean view while enjoying your meal inside or out. This VRBO property Includes charcoal barbecue, front and backyard, with ample parking on the street. Binoculars are provided to enable a view of potential passing whales, boats or perhaps a closeup view of the surfers riding a wave....visit San Diego Vacation Rentals. San Diego is a Southern California city on the Pacific coast of California known for its beaches, parks and warm climate. Immense Balboa Park is the site of the world-famous San Diego Zoo, as well as numerous art galleries, artist studios, museums and gardens. A deep harbor is home to a large active naval fleet, with the USS Midway, an aircraft-carrier-turned-museum, open to the public. 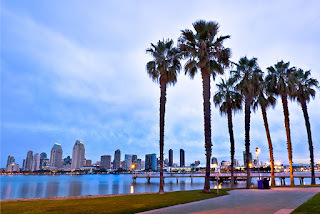 San Diego is a city that continues to grow, and though the city has a strong identity many of its residents are newcomers. With this has come the problems associated with Southern California cities, such as traffic jams and air pollution. And yet, though large itself, San Diego is also a place where many come to escape the hustle and bustle of Los Angeles, some 100 miles north.